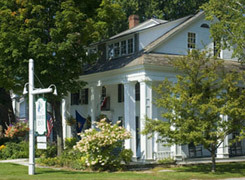 The Dorset Inn (est. 1796), our home for the weekend, is a national historic site and a wonderful base for your southern Vermont bicycle tour. This is Vermont's oldest continuously operated country inn and features charming and comfortable lodging, excellent dining, and a country collection of front porch rockers. The atmosphere is reminiscent of 18th century splendor with contemporary amenities. There are many attractions within walking distance of the inn including the Dorset Union General Store (est. 1816), antique shops, and a charming town green. And for those who plan to extend their visit, nearby is the American Museum of Fly Fishing, The Dorset Playhouse, galleries, museums and craft shops. 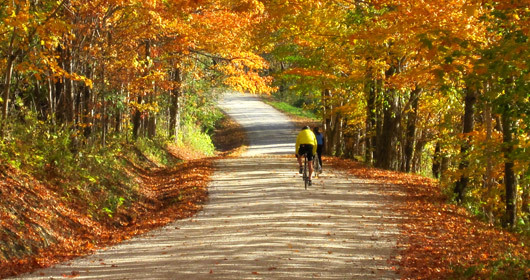 Dorset, located in the lower Champlain Valley is perfect for cycling. Saturday we will cycle north on quiet country roads passing open fields with weathered barns, beautifully maintained grand homes and lush gardens. Surrounded by the Green and Taconic Mountains, we will stop in the town of Wells where The Wells Country Store awaits with fabulous sandwiches on fresh baked bread, to be enjoyed on the village green; Try the homemade doughnuts too, you've earned it! The return route to Dorset takes us on a classic Vermont ride through the small towns of West Pawlet and Rupert and offers an opportunity to swim in a marble quarry. Sunday we ride south towards Manchester, again on lightly traveled country roads, this time under a canopy of trees. Those who choose the long route will pass beneath a covered bridge. Upon arrival in Manchester, guests may choose from myriad outdoor cafés and shop-a-holics will find it hard to resist the antique stores and brand name factory-direct shops. Others will not want to miss Hildene, The Robert Todd Lincoln Family Home, where you can take a guided tour or simply stroll the magnificent gardens, trails and woods. From Manchester it is a gentle ride back to the Dorset Inn where we conclude our tour.